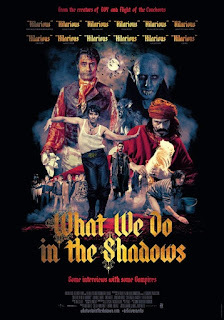 With the largely positive response to Thor: Ragnarok, I was reminded of the fact that I still hadn't seen What We Do in the Shadows, the sort of break-out cult mockumentary that first brought writer-director Taika Waititi to the attention of many in geekier circles. I'll admit I hadn't really heard of him beyond this particular movie and then his association with the Thor sequel despite his other creative ventures. So going back to watch What We Do in the Shadows after having seen Ragnarok did make for a doubly interesting experience as it was a look back at the sort of thinking that led to his unique take on the god of thunder. And in this age of "paranormal romance" stories actually being thing, taking a somewhat more absurdist view of the paranormal does make for quite the refreshing entertainment experience. Good comedy that doesn't rely on physical humor and slapstick isn't all that common these days and it takes a lot of smarts to craft one's writing in a genuinly humorous way. Synopsis: What We Do in the Shadows is a New Zealand mockumentary that claims to follow the lives of a group of vampires living in Wellington, New Zealand. The independent production had been written, directed and starred in by Jemaine Clement and Taika Waititi. The movie is filmed documentary style as we follow the lives of four vampires who share an apartment. Viago (Taika Waititi) is the sort of leader of the group. Vladislav (Jemaine Clement) is old and has a history of being quite the terror with his extensive vampiric abilities. Deacon (Jonathan Burgh) is the youngest and is a bit of a rebel. Then there's Petyr, a more Nosferatu-style 8,000-year old vampire who isn't very sociable. They have the usual restrictions of needing to avoid daylight to stay alive and thus they only really venture out into the city at night. One of the key points in the movie is when young Nick (Cori Gonzalez-Macuer) gets turned into a vampire instead of merely becoming a nother victim of their need to feed. Thus he joins the group and acts as a bridge between the older vampires and modern human society. This doesn't make it any easier for them to get more caught up with theh times, but at least they make some progress, especialyl with help of Nick's very human friend, Stu (Stu Rutherford). What I Liked: While a lot of times the humor in this movie can feel a little low-brow, there's a subtle humor to things that sort of defines the whole feel of the script. And I love that about it as it really keeps in line with the whole documentary feel yet weaving in the comedy that makes the movie so enjoyable. Every character has their quirks and idiosyncrasies and have to stay in character despite the ridiculous nature of some of their actions. Just take the big reveal about who "The Beast" is and you get a better understanding of the humor of the piece..
And then you have some clever camera work that helps the documentary piece feel even more legitimate despite its fantasy subject matter. They go to some creative lengths to depict the various vampiric abilities at work during key moments that you can probably dissect to guess how they did it but knowing the how behind it does not take away any of the enjoyment from it. What Could Have Been Better: Naturally in a movie that follows the whole mockumentary format and one so niche to its New Zealand setting, not every joke is going to land. The sublety of the humor can be too subtle at times or delivery was done in a manner that didn't quite push the humorous aspect to things. And thus movie will never be the sort of deal with universal mass appeal as it takes a certain type of person to really get into things. And the quirky crew also means some inconsistent acting performances by the team. This could be niether here nor there in terms of appreciating the movie as a whole, but as some performances do stand out, others end up feeling flat in comparison. And of course I wish we had more scene with Petyr in them because he's such a darling monster. 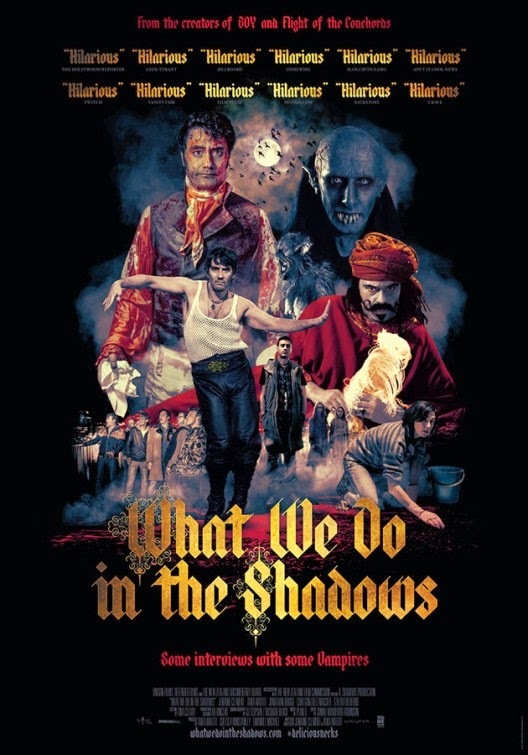 TL;DR: What We Do in the Shadows is a clever spin on the mockumentary style movie and plays on a lot of tropes of the documentary and vampire genres and uses them skillfully to present a good comedy. It's not a polished movie by any means and some bits will fly over your non-New Zealand head, but on the whole it's still a lot of fun. Thus the movie gets 4 efforts by Deacon to "look cool" out of a possible 5.